We stock twist handle orange paper bags in a variety of sizes. 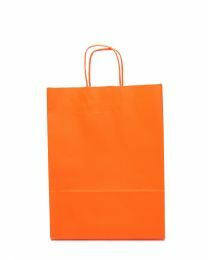 Both elegant and sturdy, these orange carrier bags are suitable for gift shops, boutiques and other small businesses. (We also sell tissue paper in a variety of colours at great prices – a perfect accompaniment). Would you like your paper carrier bags branded? Doran Packaging offer a popular personalised branding service. Show us your bespoke logo or full-colour design and it can be transferred to your bags. We’re more than happy to send out samples too. We also offer bulk buy discount.